2 posts in one morning!!! No I am not trying to be an overachiever...just wanted to share a picture with you from my son Logan's Superhero Birthday Party. Everyone was asked to dress up as a superhero. I created "Craft Girl"! I appliqued a C and G and then embroidered the words "craft girl" on a plain t-shirt. I made a utility belt and attached random craft items...hot glue gun, tag of buttons, shoe lace, pipe cleaner, scrapbook circle template, fabric flowers, crochet hook and paperclips. The arm you can't see has a crochet half sleeve and the other arm has a fabric measuring strip wrapped around which kinda made me feel like a heroin addict and it also wasn't that comfortable so it didn't last long. But the overall affect is nice. 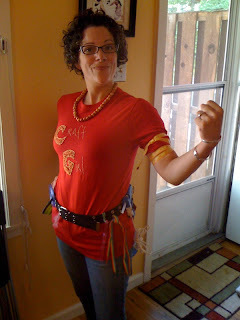 So if you ever need a quick costume for Halloween you are welcome to reinvent "Craft Girl". And I'd love to see pictures! It's a bird...no a plane...oh thank goodness!!! It's CRAFT GIRL! Here to save the day.